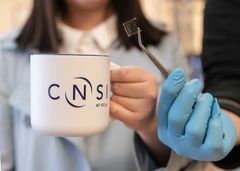 In tests, perovskite-based cells made with the same chemical found in coffee maintained their power conversion efficiency for several weeks longer than those without it. UCLA professor talks about how the event promotes software literacy within the visual arts, and visual literacy within technology-related fields, while increasing accessibility for all. The free event will include moon dust, meteorites and lunar experts. The viewing is part of International Observe the Moon Night, an annual worldwide celebration that encourages appreciation of the moon. The innovative collaboration at UCLA bridges the gap between discovery and medicine. A UCLA team has developed a set of outcome measures using a software program that aggregates the latest research and expertise about how to treat conditions. The research, the first of its kind, also suggested that two new tests could help diagnose the condition, called autoimmune pulmonary alveolar proteinosis. The early work demonstrates the promise of so-called “mechanoceuticals." The finding by a UCLA team may lead to new ways to convert petroleum waste into useful compounds. The bioinformatics approach the team used to uncover the weed killer could potentially be used to find new drugs for antibacterial medicines.